The Royal Canadian Legion suggests that the poppy be worn on the left lapel of a garment and/or as close to the heart as possible. This is the story of how the red field poppy came to be known as an internationally recognized symbol of Remembrance. This vivid red flower has become synonymous with great loss of life in war. The field poppy’s seeds are disseminated on the wind and can lie dormant in the ground for years. If the ground is disturbed the seeds will germinate. It is often found in or on the edges of fields where grain is grown which is why it is also known as corn poppy. In the spring and summer months of 1915 to 1918, during World War 1, in parts of the front lines in Belgium and France, the poppy seeds began to germinate in the ground that was disturbed by the fighting, which included the fields where dead soldiers were buried. Loved and were loved, and now we lie/In Flanders fields. We shall not sleep, though poppies grow/In Flanders fields. 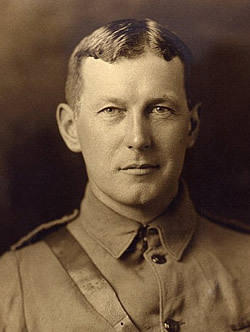 McCrae’s poem speaks of Flanders fields, but the subject is universal – the fear of the dead that they will be forgotten, that their death will have been in vain. Since it was first published in 1915, this poem has been used to remember the dead but also to incite the living to go to war. Ninety-five years ago this week, on 9th November 1918, two days before the Armistice was declared at 11 o’clock on 11th November, Moina Belle Michael was on duty at the YMCA Overseas War Secretaries’ headquarters in New York. Moina browsed through the November edition of the “Ladies Home Journal” magazine and came across the poem entitled “We Shall Not Sleep”, an alternative name sometimes used for McCrae’s poem; McCrae had recently died of pneumonia. Moina was touched and at that moment made a personal pledge to “keep the faith”. She vowed always to wear a red poppy of Flanders Fields as a sign of remembrance. Later that day Moina found one large and twenty-four small artificial red silk poppies in Wanamaker’s department store. She gave the poppies to her enthusiastic colleagues. Moina Michael was determined to put all her energy towards getting the Poppy emblem adopted in the United States as a national memorial symbol. She began a tireless campaign at her own expense. In 1919, veterans of the United States armed forces founded the American Legion to support those that had served during the First World War. A year later, after much petitioning by Moina Michael, the Legion agreed on the use of the Flanders Fields Memorial Poppy as the national emblem of Remembrance. 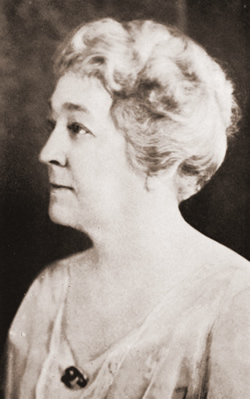 Madame Anna E Guérin, a representative of the French YMCA Secretariat was inspired by Moina Michael’s idea. She also believed that artificial poppies could be made and sold as a way of raising money for the French people, especially the orphaned children, who were suffering as a result of the war. Guerin visited or sent representatives to America, Australia, Britain, Canada and New Zealand. Canada adopted the poppy as its national flower of Remembrance on 5th July 1921. That same year Field Marshall Earl Haig, principal founder of the British Legion, approved the British Poppy Day Appeal. Other countries followed suit. Today, the Poppy Campaign is one of the Royal Canadian Legion’s most important programs. The money raised provides direct assistance for Veterans in financial distress, as well as funding for medical appliances and research, home services, care facilities and numerous other purposes. I find it interesting that one short poem and two very determined ladies culminated in nearly a century of honour and remembrance through this symbol. I encourage you to wear a poppy to show your respect for those who died for our freedom. The poppy. Lest we forget. Originally published November 2012. Edited November 2013.